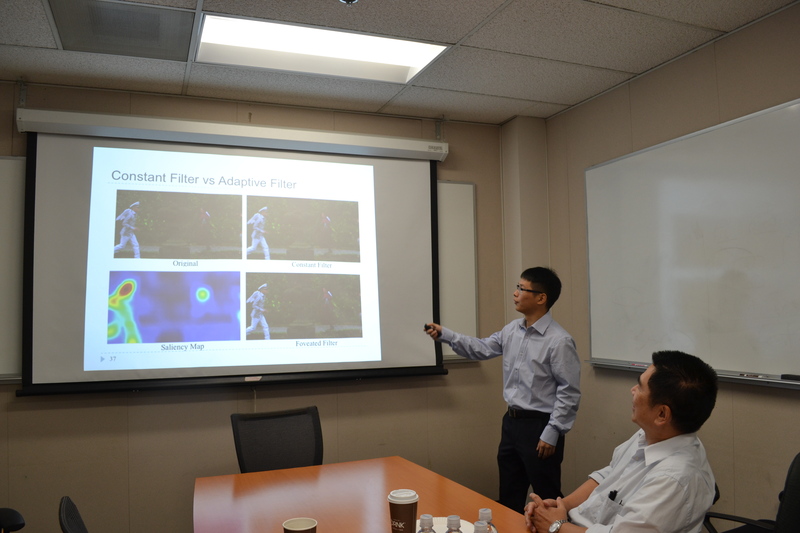 Sudeng Hu, a MCL member, has passed his defense on Oct 26, 2015. Congratulations! His dissertation title is “Techniques for Compressed visual data quality assessment and advanced video coding”. Object quality assessment for compressed images and videos is critical to various image and video compression systems that are essential in the delivery and storage. In the thesis, an image quality metric (IQM) and a video quality metric (VQM) are proposed based on perceptually weighted distortion in term of the MSE. To capture the characteristics of HVS, for images, a spatial randomness map is proposed to measure the masking effect and a preprocessing scheme is proposed to simulate the processing that occurs in the initial part of human HVS. For the VQM, the dynamic linear system is employed to model the video signal and is used to capture the temporal randomness of the videos. The performance of the proposed IQM and VQM are validated on various image and video databases with various compression distortions. The experimental results show that the proposed IQM and VQM outperforms other benchmark quality metrics. Sudeng gave a nice talk with clarity and smooth flow. The Committee was impressed by his high quality research work and results. When talking about his success in his research work, Sudeng shared his experience with us. He believes that 4 years of PhD life gives him many good memories to have in the rest of his life. He has been enjoying working and studying with our group members since the first day he joined the MCL lab. He also enjoyed conducting research here under the guidance of Prof. Kuo. Prof. Kuo and him had an interesting research topic with great challenges. They had hard time to conquer the problems in the research, but finally they made it, which gave him confidence to handle the difficulties and problems in his future life. His PhD life is so diverse that he had the opportunities to intern at different companies, which broadened his perspective of thought from merely theoretical analysis to practical usages.